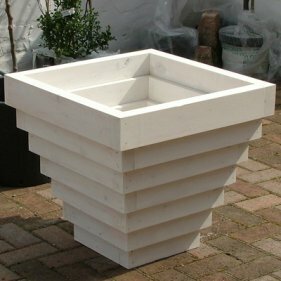 The Bloxham Wooden Planter, with it attractive corbelled shape, is suitabe for small trees, shrubs as well as flowers and bulbs. The Bloxham is made from lengths of 4.5cm x 10cm Scandinavian Red Pine that are jointed and glued with a high quality waterproof adhesive. 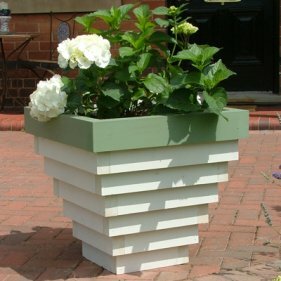 The base is slatted with 20mm thick planks to allow for drainage and the whole is finished in white (shown here with a green trim, you can do this with a Cuprinol Garden Shades sample pot to suit your scheme), golden brown or clear preservative. The internal walls of these planters are now painted with a waterproof paint sealant. such as sweet peas and black-eyed Susan intlo soft edged pyramids. Deep planters are ideal for shrubs such as hydrangeas. With formal plants, such as these, and topiary bays or box, covering the surface of the compost at the base of the plant with a gravel mulch gives a stylish and professional finish. Large planters offer a solid base for flowing plants, such as grasses. When planted with single specimens, especially if positioned in pairs, they will also lend a formal air to a garden. Although big planters make majestic focal points when filled with dramatic plants, they can also be used effectively with dense plantings of low-growing saxifrages or sempervivums.